Spanish colonisers settled on North-American territory. Half a zentury before the British reached the other side of the Atlantic, nevertheless, it is the British who shaped this land and founded the United States of America. Today, this country is once again home to "yankees" and hispanos. Gringolandia is a portrait of the USA from the early 1970s up to the beginning of the 21st century. The book outlines the continuous battle between Republicans and Democrats for the political and economic power of the American neo-empire. Based on the author's own American experience, especially during the five years he was a foreign correspondent in Washington D.C. for El País. In the eighties, Vilaró proposed that the "colonies" have a vote in the presidential elections, and today, twenty years later, he argues that Europeans should have a right to vote for those who involve us in pre-emptive wars, without revealing the objectives. The characters the author has met throughout the United States will help the reader understand and analyse the complex and influential structure of this North-American giant, covering political, economic, social, cultural aspects as well as the bi-lateral relations with Spain. 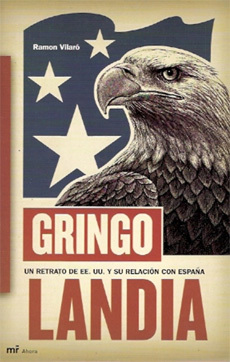 Journalist and writer reviews the framework of the historical relations between the two countries, relying on long past by the author in the U.S. since his first trip in 1971. Ramon Vilaró claims, among ironies, right of Europeans to vote for the occupant of the White House. An essay full of facts and figures used to better understand the Spanish dialogue with the U.S. giant. The book is a portrait of America outlined in the field, from early 1970 to the twenty-first century. Vilaró, that since the 80's intended to claim the right to vote from the "colonies" the best candidate to the White House, 20 years later argues that Europeans should be able to choose who we engage in preventive wars without telling their true objectives. The journey of Gringolandia going since 1971, when become a correspondent for El País daily, in 1980. Will be in time of Nixon Watergate, the economic crisis, the Ayatola Khomeini crisis and the Ronald Reagan administration. Thirty years Vilaró reflects on the history, present and futur of U.S. in narrations that mix the memories, essay and travel.